MOBIZ: Is this the end of Digital Rights Management (DRM)? 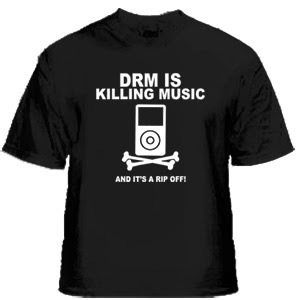 Is this the end of Digital Rights Management (DRM)? EMI Group PLC on Monday announced a deal that will allow computer company Apple Inc. to sell the record company's songs online without copy protection software. The agreement means that customers of Apple's iTunes store will soon be able to play downloaded songs by the Rolling Stones, Norah Jones, Coldplay and other top-selling artists without the copying restrictions once imposed by their label. The software, known as DRM (Digital Rights Management), is designed to combat piracy by preventing unauthorized copying, but can make downloading music difficult for consumers. Labels like DRM because users can’t easily copy songs to give to friends. Users hate DRM because they are locked in to one device or service. So what does this news mean for the Online Music industry? Well firstly it emphasizes the stranglehold that Apple has over the online/digital music market. You have to hand it to Steve Jobs, his February open letter to record companies can now be seen as a masterstroke of strategy - positioning Apple as 'the good guys' in the digital music industry and giving EMI Music a golden opportunity to take the DRM-free initiative, with Apple holding its hand. It's win-win of course for both companies - Apple reinforces its dominance and gets DRM-free music, while EMI (which had been publicly struggling to compete with the other big record companies) gets to be seen as a leader in the digital music business. "EMI Music will continue to employ DRM as appropriate to enable innovative digital models such as subscription services (where users pay a monthly fee for unlimited access to music), super-distribution (allowing fans to share music with their friends) and time-limited downloads (such as those offered by ad-supported services)." So DRM is still being seen as a competitive tool. But this move by EMI and Apple is a great first step for DRM-free music from big record companies. EMI was struggling, so really they were pushed into it (with a helping shove from Apple), but it's a brave move nonetheless. With EMI making the announcement, this would be a huge milestone for the music industry. Some analysts suggest that lifting the software restrictions could boost sales of online music, which currently account for around 10 percent of global music sales. This will send a strong message to Universal and Sony who has yet to take a definitive position on DRM.